Designed for domestic and light commercial premises, the T4 Series of programmable thermostats simplifies temperature scheduling, offering a level of usability and automated control your customers now expect from today’s technology. 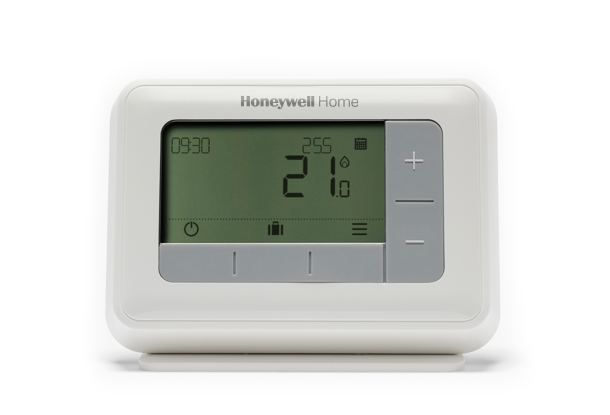 Intuitive screen interface offers easy and optimal heating adjustment. Automated modulation control improves energy efficiency. Optimisation features learn how the room is heated, requiring little customer interaction. T4 - Standard wired version ideal to fit in place of an existing thermostat. T4R - Wireless version with optional OpenTherm control via the receiver box, offering easy switch-over from an existing wireless receiver box. T4M - Wired modulating version with on-screen OpenTherm boiler information.